The Department of Housing and Urban Development quotes the average cost of a home inspection cost within a wide range from $300 to $500. However, this average estimate does not take into consideration specific location, size, configuration, age nor competence of the inspector. All of these factors can affect how much a home inspection will cost. 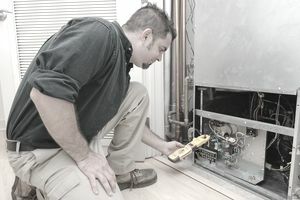 Many people are astonished to learn, for example, that almost half of the states in the country do not require state-mandated licensing for home inspectors. That's right. Odds are about 50/50 that your state does not require that a home inspector be licensed because there are no licensing requirements. Some states such as California, for instance, under the California Trade Licensing Act of 1996, prevent a home inspector from repairing a home he or she has inspected within the past 12 months. But that licensing law does not extend to, say, pest inspectors. If the cost of a home inspection is more for an experienced home inspector, it might very well be worth the additional cost. It can mean the difference between hiring a mouth-breather who hung out a home inspector sign and a professional tradesperson. Many home inspectors come from a background in the construction industry, and they learn on the job. Imagine the level of competence from an inspector who has completed thousands of home inspections. Further, most professional home inspectors also belong to a trade association, which establishes qualifications for membership and minimum annual educational requirements. If you were to hire an expert witness inspector who hand writes his reports, the cost of that home inspection report could be $1,000 or more. Most professional home inspectors charge about $400 to $450 on average for a 2,000 square-foot single-family home. Contrary, smaller two-bedroom condos might cost around $300 to $350 for a home inspection. Some home inspectors will add a surcharge for crawling under a house to inspect as well. That additional fee can vary from $50 to $100+ to enter a crawlspace (which can be damp or infested with bugs) of a raised foundation. Slab foundations are less. Does Every Buyer Pay the Cost for a Home Inspection? Bear in mind that prior to the 1990s, most home buyers never obtained a home inspection. They relied instead of seller disclosures to inform of pre-existing conditions. A home inspection was considered a luxury, an additional expense. Not so today. Today it is rare for a home buyer NOT to obtain a home inspection and, if a buyer declines an inspection, it is generally against the advice of the buyer's real estate agent. Although real estate agents do care that the buyer be fully informed, they also have another purpose for insisting buyers get a home inspection. They don't want to get sued after the fact for non-disclosures or defects. Although it might seem like a good idea from a one-stop shopping experience point of view, your so-called specialists might not really be specialists. It might be a matter of company employees capitalizing on naive customers, and the inspectors might not be fully qualified, especially if it's the same individual wearing many different hats. You should ask about specific experience and qualifications of "package" inspections. A buyer can easily spend between $500 and $1,000 on home inspections, depending on the types of home inspections the buyer needs. This is non-refundable money. Should the reports disclose enough severe defects, which could cause the buyer to cancel the contract, the buyer can't get back the money. There is also no guarantee a seller will renegotiate the sales price nor complete repairs after a home inspection. Moreover, buyers should realize that home inspectors bend over backward to find defects. The inspectors don't want the buyer to feel her money has been wasted, so the inspectors are by trade overly picky, noting every crack. Expect a report to contain a lot of defects, even for a home in relatively good condition. As of this writing, Elizabeth Weintraub is a broker-associate at Lyon Real Estate in Sacramento, California, Cal BRE #00697006.